The attribution of the two cabinets at Firle to Thomas Chippendale Senior’s workshop was confirmed by the late Christopher Gilbert in 1978 on stylistic grounds and also because of their provenance, despite the lack of bills or other primary documentation. They were part of the remarkable furniture supplied by Chippendale to Sir Penistone Lamb, created 1st Lord Melbourne in 1770, and his wife, the spirited Elizabeth Milbanke of Halnaby, Yorkshire, for Melbourne House, Piccadilly (now Albany) and Brocket Park, Herts. The cabinets were inherited by Melbourne’s daughter EmilyertforsHerts. Hert who married the 5th Earl Cowper, and they eventually passed to the niece of the 7th Earl, Lady Desborough of Panshanger, Herts. Her daughter Imogen, Viscountess Gage, brought them to Firle after her mother’s death in 1952, together with her share of the Cowper heirlooms. Chippendale’s relations with his client Lord Melbourne and the latter’s architect at Melbourne House, Sir William Chambers, illustrates the delicate etiquette surrounding the three principal parties of an 18th century furnishing campaign. The convention was that the client would seek the advice of his architect in deciding which furniture maker or supplier would be suitable for a new commission. If the client wanted a particularly bespoke piece of furniture or group he might request a presentation drawing from the architect for which he would be obliged to pay: numerous examples of furniture designs for specific clients by Robert Adam have survived, although only one suite of chairs and sofas from an Adam drawing is known to have been made by Chippendale. Even if the client insisted on using his own furnisher, it was usual for the architect to approve the proposed schemes, or at the very least those which impacted on the architectural character of the interiors. Chambers went on to criticise the large numbers of mirrors and wall sconces proposed for Lady Melbourne’s Dressing Room, and he made clear he wanted fewer sofas and more chairs in the Saloon. He also wanted his client’s approval for the design of the proposed door escutcheons in the principal apartments. This was by no means the only contretemps between architect, client and furniture maker. The following year Chambers annoyed his client and exceeded his brief by ordering from Chippendale a set of chairs with what Melbourne described disparagingly as having ‘a load of gilding’, evidently unsuitable for a first floor lobby, particularly as Melbourne had expressed his preference for painted furniture for this particular space. Despite the disagreements there is no doubt that Melbourne House was a magnificent success and probably Chippendale’s finest London commission. A good idea of its splendour is described by Thomas Mouat, a visitor from the Shetland Islands, who was given a tour of the building in 1775 by Chippendale’s business partner Thomas Haig. Mouat described in some detail the rich interiors, textiles and fittings, including the prices paid for many of the pieces, the information no doubt supplied by his companion. The most expensive by far was in the ‘very handsome Dining parlour…a Commode table of inlaid work, cost £140’. If this figure was true (or even if greatly exaggerated) it would have been by far the most expensive piece of case furniture supplied by Chippendale to any of his clients, far exceeding the cost of the famous Diana and Minerva commode supplied to Harewood in 1773 for £86. The subsequent history of this fabulously expensive object remained unknown until 1997. Then, it was conclusively proved by Joseph Friedman that it had been sold at Christie’s sale of the contents of York House (as Melbourne House had become known since 1791) on 18-19 May 1802, lot 178, ‘a large handsome inlaid commode of beautiful wood, ornamented by Ormoulu’. It was bought by Sir Sitwell Sitwell of Renishaw who removed it to his Derbyshire seat where it has been ever since, becoming known as the Renishaw Commode. The reasons for the extraordinary high cost of the Renishaw Commode can be understood by comparing it with the Diana and Minerva Commode at Harewood, its most closely allied piece of documented Chippendale furniture. This is conceived as a tripartite breakfront dressing commode intended specifically for the window pier of the State Dressing Room. Its main feature is the very finely executed central concave recess with trompe d’oeil marquetry which would enable someone to sit with a certain amount of ease while using the toilet mirror and other items contained within the central drawer. This once contained an adjustable fitted mirror and is divided into compartments for the necessary toilet accessories. The side doors have ebony roundels each with a mythological figure in marquetry with the flesh parts executed in ivory (to be used again for the ‘emblematic heads’ table in an adjoining room). The roundels are surrounded by laurel wreaths suspended by lover’s knots. Elsewhere on the commode the decoration consists of repeated garlands of leaves, radiating fan motifs, and scrolling acanthus ornament. Importantly the use of ormolu is restricted to the stiff leaf scrolled brackets in the entablature. The main veneer is a golden satinwood, crossbanded with tulipwood. In contrast the design, purpose and ornamental features of the Renishaw commode have significant differences. There is no evidence that it was ever intended to be a dressing commode: the central drawer is too shallow to accommodate a fitted mirror or compartments for maquillage. It has instead a mirrored panel occupying the centre of the top surface where a display of marquetry might have been expected. Thomas Mouat’s account records it in the Dining Room at Melbourne House on his visit in 1775, although the 1802 sale catalogue describes it in the adjoining Breakfast Room. It may well have been the ‘large sideboard’ among the various things listed to be removed for Sir Sitwell after the sale. The purpose of the unusual mirrored panel is open to speculation, but if the commode was being used as a sideboard table in the Dining Room it may well have been for displaying some of Lord Melbourne’s ornamental silver plate, possibly reflecting the underside of a large vase or sporting trophy, in the same way that silver centrepieces were often placed on long mirrored plateaux down the length of dining tables for grand banquets. The mirrored panel would most certainly have added considerably to the cost of the piece, as would the profuse ormolu. Here the six ‘pilasters’ which articulate the architectural character of the piece are each faced with ormolu: brackets, garlanded buchrania, panels of tapering stiff leaves, terminating in a characteristic ‘flare topped’ reeded form above a palmette. It is interesting to note that identical ormolu mounts appear on other Chippendale pieces, for example the buchrania on the Harewood Library Writing Table at Temple Newsam. A major difference between the two commodes is the use of holly as the principal veneer on the Renishaw commode – its wonderful white silvery sheen now faded to a golden patina which has for so long confounded its identification as satinwood. Originally the marquetry decoration based on the classical repertory and consisting of a variety of different timbers, either in their natural state or using dyes, would have stood out far more boldly than we see today, with the different timbers and dyes making striking contrasts. Adam Bowett has suggested the effect may have been intended to imitate scagliola. The ornament of both commodes derives of course from a generic neo-Classical repertory but there are significant differences: on the Renishaw commode the recessed lower section has a bolder fan shaped marquetry motif incorporating a gout grec vase with Francophile leafy ‘well ropes’, which are repeated in the entablature. Instead of the semi-circular fan motifs found on the Diana and Minerva commode there are framed anthemia or honeysuckle leaves. But the biggest difference is found in the two rosewood ovals in the doors containing marquetry figures – Geometry and Architecture. Figurative marquetry is not often found in Chippendale’s oeuvre, although a notable parallel can be seen on the secretaire from the State Dressing Room at Harewood. It has to be admitted that the figures are in no way as fine as the examples being made by (or attributed to) the Swedish marqueteur Christopher Fuhrlogh working for Chippendale’s rival John Linnell. This now brings us to a consideration of the two cabinets at Firle. Stylistically the cabinets relate so closely to the Renishaw Commode that it is tempting to think the three pieces were conceived as part of an ensemble for the same interior at Melbourne House. In addition to their use of holly as the principal veneer they share many of the same ‘architectural’ features. The design of each is based on an implied triumphal arch with a classical ‘order’; they all have slight tripartite breakfront divisions; they have curved sides (admittedly a characteristic feature of Chippendale’s furniture intended for wall piers, some say to accommodate full-length curtains when drawn open); and there is a consistent use of circles, semi-circles and ovals in the construction and decoration. Although none of the marquetry motifs match precisely there are some striking ‘echoes’: the fan motif in the front of the commode is repeated on the sides of the cabinets; vases and urns are used as the central motifs of the lower sections; and there is a plethora of anthemia or palmettes, both in marquetry and in ormolu, on each of the pieces. Identical ormolu mounts ‘palmette and ‘flare-topped reeded forms’ are found at the foot of the pilasters of the commode and the lower corners of the cabinets. It takes little imagination to see how the three pieces would make a remarkable unity if they were juxtaposed in a great interior with three windows, possibly each piece occupying a pier, with a large mirror or pier glass above the commode. Yet the design and execution of the marquetry is different from anything else from Chippendale’s workshop. There is a real plethora of motifs on the Renishaw and Panshanger pieces, almost a horror vacui, which is uncharacteristic of most of Chippendale’s work and not seen on other pieces of this date. Chippendale was usually extremely careful to balance plain and decorated surfaces, and never afraid of leaving areas free of ornament. There are exceptions of course, but they are almost certainly examples based on drawn designs by architects. The unique design and sophistication of the Panshanger and Renishaw pieces indeed suggest the hand of an architect, in this case Sir William Chambers. We have noted he described himself as a ‘Very pretty Connoisseur in furniture’, and this ex Melbourne group may well represent Chambers’s success in persuading his client to approve at least some interventions with ‘some parts [of Chippendale’s first designs] which may be improved a little’. 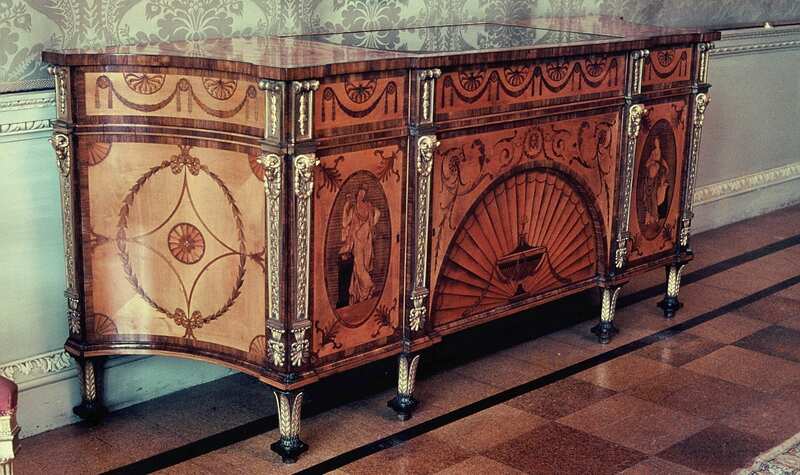 Some of the marquetry motifs on these pieces appear to be unique in Chippendale’s oeuvre, notably the pairs of tripods with their burning flames on the cabinets and the pilasters forming ‘chains’ of reversed palmettes; and on the commode the oval panels with figures representing Geometry and Architecture, perhaps derived from Angelica Kauffman. This all suggests a new and different hand in the design. It could well be argued that the cabinets and the commode represent Chambers’s most self- conscious attempt to provide an alternative to the Adams’ primacy in furniture design imitating the ancients. In particular the strongly architectural form; the use of marquetry ‘enchainements’ in the pilaster slips of the cabinets; the ‘gout grec’ vases; and the draped ‘well ropes’; all these point to a subtly different vocabulary. There are some interesting parallels with Chippendale’s work of the early to mid 1770s which might be noted and even suggest a ‘legacy’ of the Melbourne House group. Not least a recently discovered mahogany bureau bookcase at Harewood, c1775 has mirrored glass roundels on each glazed door together with rectangular glazing bars (echoing Chippendale’s use of this motif on the Wilton Violin bookcase of c1760). Another satinwood bookcase with a not-dissimilar pattern of glazing bars but with two central oval mirrored panels, was offered by Christie’s 9 July 2015, lot 153. It was in an altogether different league to the Panshanger cabinets, relying for its visual effect on its proportions and fine cuts of veneer. Both these examples have prompted the question as to whether the cabinets may originally have had a mirrored panel in the central glazed compartment. Yet a recent examination by Peter Holmes has revealed no evidence of silvering and a very sophisticated use of mahogany slips to hold the glass in place. It is sad that Chambers was not able to continue his interest or connoisseurship in furniture very extensively, nor his partnership with Chippendale, probably because of pressure of work on his many architectural commissions. His work for the Duke of Marlborough, Earl Gower and the Earl of Charlemont took him in different directions, as did his designs for silver and ormolu. The extent to which bookcases and china cases were interchangeable in function is open to debate. Chippendale was specific, if not dogmatic, in describing the designs in the Director as being one or the other: bookcases generally in the Gothic or ‘Palladian’ style and china cases generally Chinoiserie. Yet there is evidence that bookcases could be used for storing and displaying china and vice versa. Thus the use of the Panshanger cabinets for this purpose should not be entirely discounted. If they were, the purpose of the large central roundel might have been to ‘frame’ a particularly prized piece. Peter Holmes has suggested that the solid mahogany shelves indicate their use for the display china – the wood intended to be visible rather than hidden if they contained books. If this is the case, then it is interesting to speculate on what might have been appropriate. Chinese or Oriental pieces would surely not have been found in such an emphatically neo-Classical setting. It would seem more likely they could have contained some of Lord Melbourne’s French porcelain, such as the Sevres service of 1770-1, with its many different shapes on a turquoise pointillé ground with roundels and oval reserve panels with putti, musical instruments etc, linked with garlands of husk flowers, all echoed in the marquetry decoration of the cabinets. Yet a recent experiment demonstrated that the alignment of the shelving and glazing bars did not conform easily with the shapes and sizes of this service. Alternatively, if Lord Melbourne had a collection of biscuit figures and groups (either European or from the Derby factory), they might have fitted well here, not least echoing the silvery white sheen of the veneer of the cabinets. Yet again, the strong neo-Classical character of the furniture might also suggest they could have displayed a group of English or French vases such as were being produced at Chelsea – Derby, or Wedgwood’s agateware, basaltware, or even his new range of Etruscan vases. This would certainly fit if it were ever discovered that the Dining (or Breakfast) Room at Melbourne House was in the newly fashionable Etruscan style. I am grateful to Deborah Gage, Lucy Wood and Jack Metcalfe for sharing their thoughts with me on some of the issues raised by this group of furniture. Christopher Gilbert, The Life and Work of Thomas Chippendale (1978), p. 264. Brocket Park, Herts, was designed by James Paine. There seems to be little evidence that either he or Sir William Chambers were involved in the furniture supplied there by Thomas Chippendale. See infra. Gilbert, pp. 260-2. Brocket Park was the work of the architect James Paine and the furniture supplied by Chippendale for the house does not seem to have been considered within the remit of the architect. See for example Chippendale’s letter to Sir Rowland Winn of Nostell, 21 June1774:’I have sent…by the York coach a small case contain’g a section of the Saloon with designs of the furniture which has been settled by Mr Adams and myself & he totally approves of everything therein sketched…’cited by Christopher Gilbert, ‘New Light on Nostell Priory’, Furniture History, xxvi (1990), PP. 59-60. William Chambers to Lord Melbourne, 14 August 1773, Letter Book, British Library Add MS 41133, p. 107; cited by Gilbert, p.260; Nicholas Goodison, ‘William Chambers’s Furniture Designs’, Furniture History, xxvi (1990), p.68; Hugh Roberts, ‘Sir William Chambers and Furniture’, in Sir William Chambers: architect to George III (1996), ed. John Harris and Michael Snodin, p. 163. Its genesis is described in full in The Survey of London xxxiii Parish of St. James, Westminster. Part II: North of Piccadilly (1963), p. 369 et seq. Quoted by Francis Bamford, ‘ A Shetlander in St Martin’s Lane, 1775’, Furniture History, xi (1975), p. 109. Joseph Friedman, ‘New Light on the Renishaw Commode’, Furniture History, xxxiii (1997), pp. 143 – 9. Other comparable commodes are listed by Friedman, pp. 148-9, n.4. Recent analysis by Lucy Wood confirms this feature as being original. It was damaged in the early 1970s and is now covered by a new mirrored panel. This motif, generally executed in carved wood, is very characteristic of the Chippendale workshop during the mid to late 1770s. See Dudley Dodd and Lucy Wood, ‘The Weeping Widow Commode and Other Orphaned Furniture at Stourhead by the Chippendales, Senior and Junior’, Furniture History, vol xlvii (2011)., p.62, fig. 12. See for example Lucy Wood, ‘A Bonheur du Jour at Stourhead: the work of John Linnell and Christopher Fuhrlogh’, Furniture History, vol xliii ((2007), pp. 55-68. The famous suite of chairs and sofas designed by Robert Adam and made by Chippendale for Sir Laurence Dundas display a wealth of neo-classical detail which the architect was determined to show off irrespective of its success as a piece of furniture. It is not unlikely that the lyre back seat furniture at Nostell is from a lost design by Adam: almost every inch is carved with the full repertory of classical ornament suggesting a similar determination. Eg John Harris, ‘Early Neo-Classical Furniture’, Furniture History, ii (1966), p. 3. William Chambers to Lord Grantham, 13 August 1773. Letter Book, British Library Add.MS 41134, p. 34, cited by Goodison, p. 79. The Melbourne provenance has been disputed. Yet in the ground floor library at Melbourne House the bookcases were apparently painted and, it is surmised, similar to the bookcases in the library at Brocket (see Harris and Snodin op. cit. p.92; Gilbert op.cit. vol. 2, figs 76-80). A pair of marquetry bookcases juxtaposed with painted ones might have looked discordant. Eileen Harris has suggested that Robert Adam’s design for ‘the Cabinets for the Room over the Anti Room’, at Lansdowne House was for the display of his client’s large collection of Chinese and Japanese porcelain (Eileen Harris, The Genius of Robert Adam: His Interiors (2001), pp. 128-9). Deborah Gage, ‘Masterpieces of Sevres Porcelain’, Antique Collector, June 1984, pp. 88-99, and Arthur Lane, ‘Sevres and Other Porcelain in the Collection of Viscount and Viscountess Gage: at Firle Place, Sussex’, Connoisseur, April 1955, pp. 158-163.